Preschoolers are sometimes the youngest and smallest members of our homeschool. Many times these precious wee ones are often the most energetic members as well! Consequently, homeschool moms are always looking for fun and hands on activities to keep these enthusiastic little learners happily engaged. 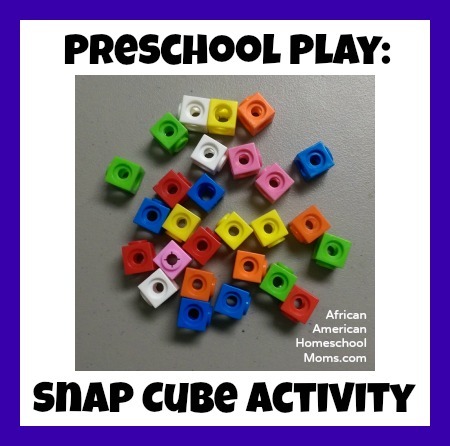 My Snap Cube Activity is an awesome activity for the little ones. It reinforces both colors and counting and even includes a hands on component young ones are sure to love. I store mine in a large zipper lock plastic bag and keep it inside our Preschool Activity drawer. Read on to learn how to play the Snap Cube Activity and then download the materials you can use at home. Laminate all the cards and cut out each card. Gather a large lot of multicolored Snap Cubes (or Unifix Cubes) and place them in a shallow container. This will make it easier for the child to sort through the colored cubes. Create two stacks of cards. One stack will contain the Snap Cube Color Cards and the other stack will contain the Snap Cube Number Cards. Shuffle the cards in each stack. Ask the child draw a single card from the Number Card pile (for example green). Ask the child draw a single card from the Color Card pile (for example 5). Instruct the child to find five green cubes and snap them together. Have the child continue to draw cards and snap cubes together until play is done. © 2016, Andrea Thorpe. All rights reserved.